Hi, I’m Lauren, and I’m so glad you’re here. I love working with growing families here in the Atlanta area to create images to cherish for generations. Reach out anytime with questions or to plan your session! I first worked with Rashida for her maternity and newborn sessions when she had her second son. They were surprised with baby #3 and thrilled to find out they were having a little girl! She immediately contacted me me to get in the calendar for Fresh 48, maternity, and newborn sessions. You can see their gorgeous family field maternity session by clicking here, and their daughter’s newborn session will be posted later this week! 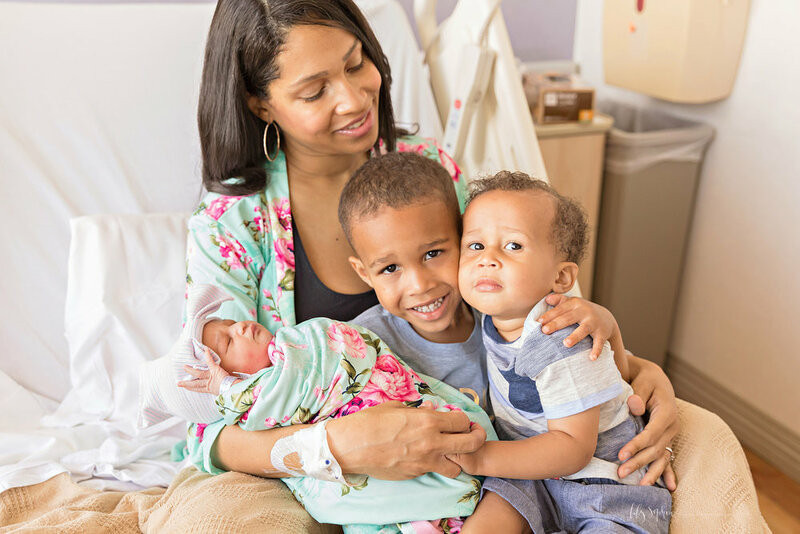 As with their second son, they had their daughter at Atlanta Medical Center, which is one of my favorite hospitals to photograph at due to the large windows in most rooms. When Rashida went into labor, she texted me to let me know so I had the heads up. Her labor with baby girl was super quick compared to the previous one, and I made arrangements to come to the hospital the next morning when big brothers would be coming to meet her. Rashida had bought a mommy and me set for the hospital, which was just adorable. After two sons, she was ALL about the mommy and me girly things. Fresh 48 sessions are photographed in whatever you’re wearing! For some moms, it’s a simple robe from home or even the standard hospital gown. Babies are generally in their hospital onesie and hat, but some mamas prefer to dress them in a special outfit and/or wrap them in a swaddle. There is no right or wrong way to go about it - I discuss the different options with each of my clients when they book. I started with taking images of Jordyn in her mother’s arms, and then got ready for the big brothers to come in and meet her. I LOVE photographing sibling meetings. Every big sibling reacts differently! Biggest brother Jaiden was absolutely in love and all about his new baby sister. Big brother Jace was not so into it, and quite suspicious of this new tiny person taking up HIS spot in his mama’s arms. (I’m happy to report he has since come around and adores his baby sister!) Grandma and Grandpa were on hand as well, so they jumped in for a few images as well. I am happy to include your extended family members in your Fresh 48 session as I think grandparents are so special! I just ask for time alone with your family when I first arrive before bringing others in so that we can have the quiet moments of just your immediate family first. It can sometimes be a little chaotic when we have lots of visitors around! 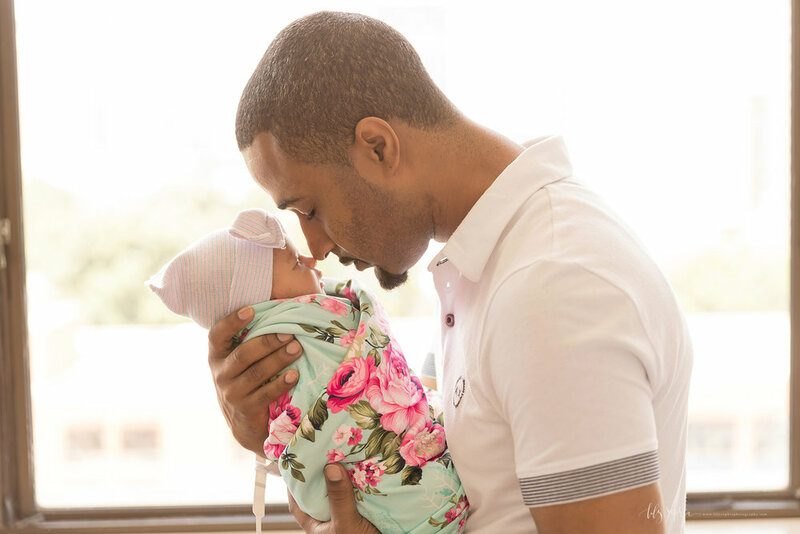 We finished up with parent images, and I am just dying over the ones of Jordache with his little girl. There is just something about new daddies with their baby girls that get me every time. I’m so blessed to have one of the most amazing dads on the planet, and I married one of them too. It takes me back to those moments where he held our daughters for the very first time, and so many wonderful memories come flooding back. One memory that comes to mind…. I’ll never forget my husband’s reaction when our first baby sneezed (VERY loudly if I may add!) for the first time after we were home when she was about two days old. Just envision the most amazed look on a person’s face that you can - that was the expression on his face. She started fussing immediately since the sneeze scared her. I remember the way he gently talked to her to calm her down after the sneeze, and the way he held her and rocked and swayed. I remember how tiny her barely 7 pound body was in his arms snuggled up against his chest. I want you to remember these moments with your baby too. Aside from taking care of clutter upon arrival, Fresh 48 sessions are EASY. These sessions are a documentary lifestyle session, and I love them. I don’t edit your baby’s newborn skin for Fresh 48 sessions, because that would take away from how they truly looked in those first hours. If you’re having a postpartum breakout, I’ll take care of that for you when I edit! Your Fresh 48 images will be unforced, unfold naturally and preserve you, your partner, big siblings, and your baby exactly as you were in those moments. I want you to smile when you look at the images of your baby's sweet features and remember how the top of their head smelled so fresh and perfect. I want the memories of those first days to come flooding back, and I want you to wonder aloud how the time went so fast. Enjoy a handful of baby Jordyn’s Fresh 48 session images! If you're pregnant and looking for a newborn or maternity photographer, I would love to work with you to create images that you will love for a lifetime. Be sure to view this short 1.5 minute film to hear about my philosophy and see how I work in the studio so you can determine if I'm the right fit for you. I can't wait to meet you! Atlanta Maternity, Newborn, and Family Photographer | Our Annual Blogging Break! Atlanta Newborn Photographer | Follow me on Instagram!